It was billed as a rally for the NHS in a marginal seat in Northamptonshire. The Labour candidate is Phil Hope - thus allowing the audience of almost entirely Labour supporters to wave 'Vote Hope' banners, and the prime minister to deploy lots of puns in a speech. He told us once more the health service saved his eyesight, and that the Conservatives would wreck the economy. An actress from the BBC's 'continuing drama' Casualty sang the praises of Labour's achievements. So far, pretty standard stuff on the campaign trail. But some strategist or other must have decided the time was now or never to try something different. We had been promised a mystery guest to out-do Gary Barlow's endorsement of the Conservatives. A morale-booster for the activists, but with some senior Labour figures feeling the party is trapped in the ghetto of its own core vote, perhaps this type of event could have been used to appeal floating voters. So it happened that Elvis - aka Mark Wright from Corby - entered the building as the prime minister concluded his speech. 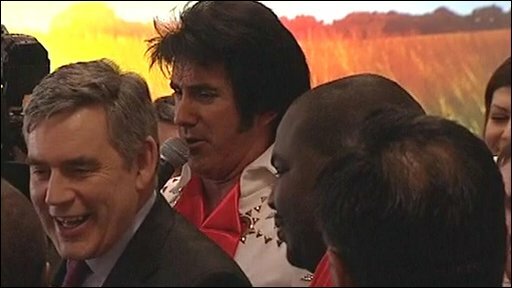 The impersonator serenaded the Labour Party supporters with A Little Less Conversation. Perhaps that was a warning to Brown to go easy on the heavyweight policy stuff. Or perhaps crooning about "a little more action" was really intended to underline the message that Labour would now up the tempo of the campaign. The prime minister had left the hall - and almost left the building - but a few minutes later came back into the venue to join the party members who by now were singing along and swaying their arms as the whole thing culminated in a crescendo with much of the room singing The Wonder of You. While his wife Sarah exercised her vocal cords, he simply shook hands with the Elvis, and looked a little embarrassed as the snake-hipped impersonator sang about how "nobody understands me". A morale-booster for the activists, but with some senior Labour figures feeling the party is trapped in the ghetto of its own core vote, perhaps this type of event might have been intended to appeal to floating voters. Apparently there is a lot less fun ahead for them as Gordon Brown is set to focus on warnings over the economic recovery. But even in this most bizarre of election events, the prime minister still returned to type. He seems to have a statistic for everything, and reminded us that now only 4 per cent of people believe the real Elvis didn't perish in his Graceland mansion 33 three years ago.